I love this cake. 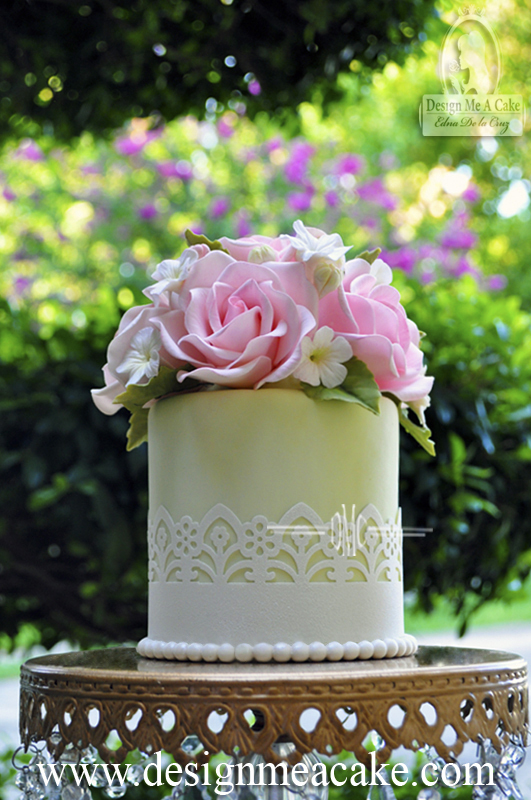 Just one single tier, but it’s so delicate and elegant. I designed this cake last year and some people were asking me how it was done. With so much work on my hands, I postponed doing a blog or tutorial because I really wanted to do a You Tube video about it. I suppose for now I will do the blog and eventually I will let you know when the video tutorial is finally done. This cake was covered in Fondant. I used Americolor Neon Green liquid-gel to color it. I love that tint. It can go from very delicate, if you use a little, to very funky, if you use a lot. Edible Image Paper from Icing Images Co. In the photo above you will observe a very delicate lace was used. 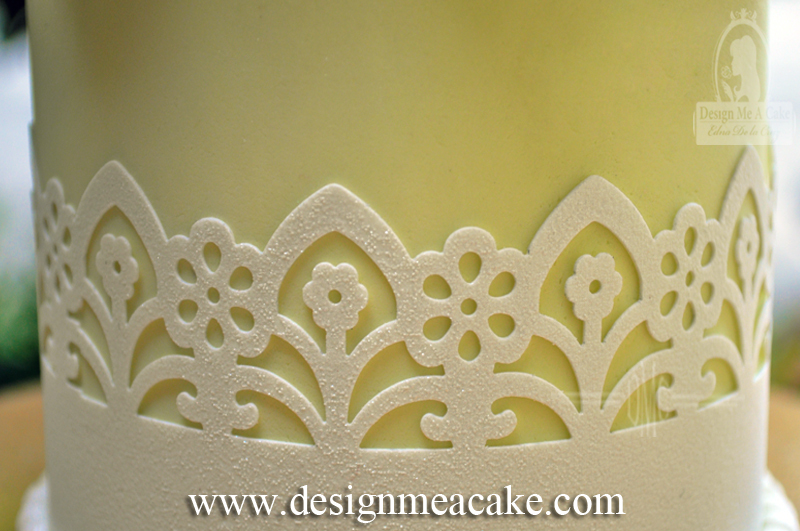 The lace was made with a Martha Stewart cutter and an edible paper from a company called Icing Images, (link posted below).This particular paper has a pearl finish to it and they offer many beautiful colors you can choose from. The name of this cutter is Deep Edge Punch-Garden Gate. These punch cutters are really fun to use for scrapbook projects but they also work really well for cake when you combine them with edible image paper. It’s very important to use paper of very good quality. Some papers are too thin or they dry too fast. This is why I love the Icing Image papers. They are thick and give you a bit more time to work without the paper breaking or cracking. NEVERTHELESS, still it’s a good idea to work fast so the paper doesn’t break. I always keep my edible paper in the original plastic bag it came in and sealed well so it doesn’t dry. I also store it in a dry place because humidity can affect the paper, just as it affects anything with sugar in it. Just make sure to take care of the paper and store it well. Never leave the paper uncovered so it will last longer. using it for this type of work. Once the paper is cut, I place it in the punch, carefully aligning it to the back line of the cutter. This will ensure a straight cut every time. After you cut the first part you move that and align the cut with the side wing of the punch where the design is imprinted. This is very helpful when you make cut after cut, always ending up with a perfect pattern. First practice with a regular piece of paper until you get used to it. I will be doing a tutorial of this soon to better show how to use it. How thick you want the strip is just a personal choice. Just cut it to whatever thickness you prefer it to be. To finish the design, I used the Perfect Pearl Mold. I love this mold when making pearls. Here below is an old tutorial I made on how to use the mold. I am planning to redo this tutorial but for now this is still the way I make pearls. For those who want the mold, here is the link to it. Click here. I use this mold all the time as it has 3 delicate pearl sizes. leaves, stems and even thorns. Then it teaches you how to color your roses. Gumpaste Roses, blossoms, leaves and fillers. The blossoms and buds are part of my DVD “Blooms and Vines”. This DVD shows how to make Hydrangeas, blossoms, buds, their leaves and Ivy vines. 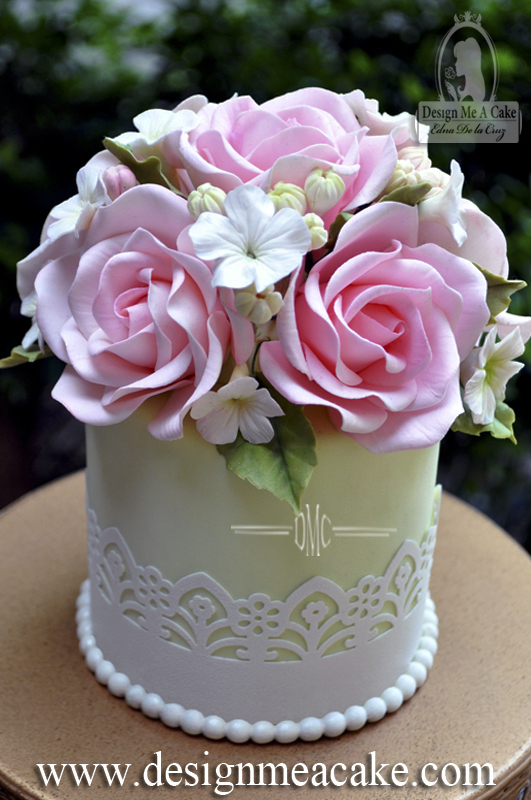 It even includes how to make these flowers without cutters, another way to make flowers. Finally, it teaches how to color and finish them. Remember that in my website there are a number of tutorials that can help you get started in the wonderful world of cake decorating. You will find them under tutorials. If you are a beginner and have never done gumpaste flowers, I suggest you start with my tutorial on “How to Make Calla Lilies”. I am posting all the links below too, so you can go check them out. I hope you enjoy this “How Did I Do That” blog. I will also do a tutorial soon. Until next time, ta ta!! This entry was posted in Baking and Cake Decorating, Cake Decorating.. news, Gumpaste Details and tagged advanced cakes, beginner cakes, cake decorating, cake design, cake tutorials, Design Me a Cake, edible paper, Edna De la Cruz, fondant cake, gumpaste, gumpaste blossoms, gumpaste flower arrangement, Gumpaste flower DVD, gumpaste flower fillers, gumpaste leaves, gumpaste roses, icing images, learn to decorate cakes, pearl molds, Sugar flowers, sugar pearls by Edna De la Cruz Design Me a Cake. Bookmark the permalink. Will definitively be in my to do list! I just read through your blog on wafer, and the timing was perfect. I didn’t know what company to order from. I’ve made wafer paper roses although it is very intricate work it’s so worth it. As always your work speaks for itself. Thank you for the information. This is edible image paper, but they have awesome quality wafer paper too! Please how do I get all these DVD’s listed above.l reside in Nigeria.l am really eager to learn. You can get them on http://www.designmeacake.biz. But if you want give me a day or 2 to add a package deal where you can buy all of them in a bundle! Great post . . . thanks so much. A couple of questions if I may: if I was doing this with wafer paper, instead of edible image paper, how would I adhere the paper to the fondant? Also, is there any way to attach wafer paper to buttercream? Thanks so much! I haven’t adhere wafer paper to buttercream yet. I usually use edible paper since is stronger. 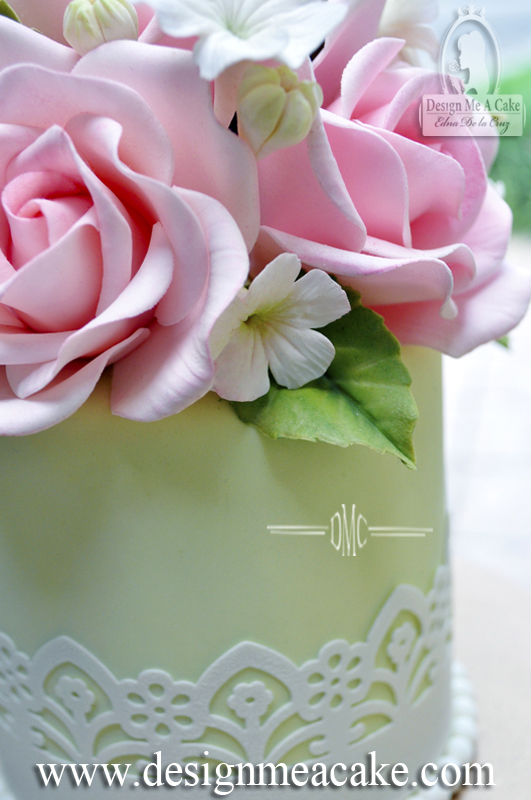 You can use piping gel as glue with wafer paper. I will test the buttercream and the wafer paper to see how well it does.